This season BIKETOWN members and account holders can donate surplus credits to help cover the first month of membership for BIKETOWN for All members. Photo by BIKETOWN. (Nov. 30, 2018) BIKETOWN members and account holders will have a chance to share their love for the bike share system with others this season through the program’s “Pay It Forward” campaign. This new initiative allows users to donate credits to BIKETOWN for All – the City’s program for discounted bike share memberships for Portlanders living on low incomes – to cover the first month of membership for BIKETOWN for All members. 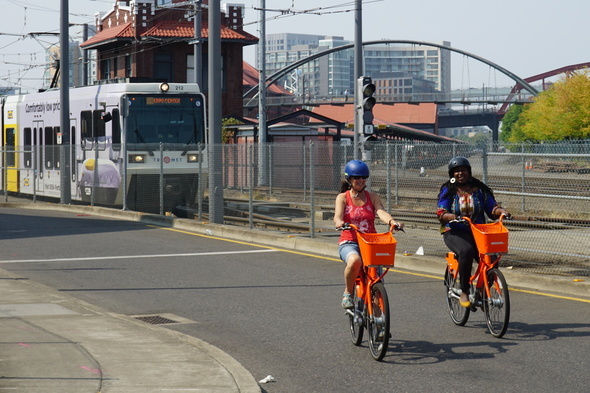 BIKETOWN offers numerous ways for system users to earn credits on their balance by doing activities that support a well-balanced bike share system, like riding bikes parked outside of a station back to a station or by participating in the BIKETOWN Bonusprogram. Those credits can then be used to cover the cost of their rides or their monthly membership dues. After signing up, many BIKETOWN users quickly generate more positive credits on their balance than they need – leading to a surplus that could easily be reallocated to users who could use some financial support. Members can check to see if they have a positive balance by logging into their account and can fill out a simple form to indicate their desired credit donation amount. All donated credits will be used to support the BIKETOWN for All "Pay-it-Forward" program. A BIKETOWN for All membership costs $3 per month and includes 90 minutes of daily riding time. The goal of the Pay-It-Forward initiative is to gather enough credits to make the first month free for every BIKETOWN for All member and eliminate a potential hurdle to membership. BIKETOWN for All members will never pay additional fees for going over time limit or parking out of the service area. Individuals who are Oregon Trail Card holders, live in affordable housing, and/or receive other social services can sign up for a BIKETOWN for All membership online at www.biketownforall.com. There are currently 440 BIKETOWN for All members. The top BIKETOWN rider is a BIKETOWN for All member with a total of 2,200 trips made since the beginning of the program. Of the top ten BIKETOWN users across the bike share system, seven are BIKETOWN for All members. Annual BIKETOWN members, on average, have at least five credits on their account at any given time. All new BIKETOWN for all Members will receive the $3 Pay-it-Forward credit and, as part of their membership, agree that when they generate enough credit to pay for their next 6 months, $3 will be donated from their account back into the Pay-it-Forward program. The “Pay it Forward” opportunity will be available for general BIKETOWN members this season, to give all BIKETOWN members, not just BIKETOWN for All members, an opportunity to contribute and support the program. Learn more about BIKETOWN for All at www.biketownforall.com.